Do you find yourself tired at the end of the day? Are you struggling to access emotions? Do some interactions leave you feeling drained of all your energy? If you answered yes to any of these questions, you might be overdue for a spiritual cleansing session. This practice removes negative energy and enforces positive endurance. This practice of spiritualism, will give you the reset you need. New to spiritual cleansing? Let’s explore this practice in its entirety. 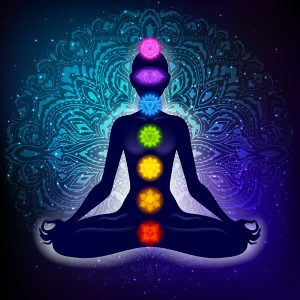 Here, we’ll go over the meaning of cleansing, ritual steps, and a few methods of cleansing your aura! 1 What Is Spiritual Cleansing? Before we can go into the details of cleansing, we should first define what it is. Spiritual cleansing is the ritualistic practice of absolving yourself of negative energy. It is the habit of continually reaffirming the purity of your spirit. In the practice of spiritualism, all things are composed of prana – universal energy. Albert Einstein theorized that the entire universe is made of energy. This energy vibrates on different frequencies. Lower frequencies reveal solid objects, such as humans, rocks, animals, etc. Higher frequencies vibrate so quickly they tend to be invisible to the human eye. Every human body is comprised of multiple forms of prana. Low vibrations make up the physical form. High vibrations surround the body. This high energy spans 4-5 feet outside the body, scientifically known as an electromagnetic field. Within spiritualism, we refer to it as an aura. If you were to pet an animal, have a good conversation, or hold a newborn, you would be partaking in positive energy. Your aura will absorb this positivity and be strengthened by it. If you are in a relationship with a toxic person, dominated by someone else’s will, or in an unhealthy environment, your aura will absorb negative vibrations. These vibrations can fragment and weaken your aura. All of these interactions feature an absorption of energy. While positive energy will strengthen you, negative will weigh you down. Remember, even if you remove yourself from an unpleasant situation, you will still carry negative vibrations without your aura. By mindfully releasing unhealthful energy, you can clear your aura of any gunk that is weighing you down. This process is what we call a spiritual cleanse. There are multiple ways to go about a cleanse. Although many methods differ, the process always has the same goal. It’s about ridding your aura of negative energy, no matter which way you go about it. Every spiritual cleanse will begin by entering into a heightened state of being. This is a period of preparation for the oncoming ritual. This includes meditation and taking stock of the current moment. Through adopting a present mindset, you actively connect to your own flow of energy. Once you have entered into a heightened state of awareness, you have to identify the negativity that you wish to release. These can be audibly named, mentally acknowledged, physically written out, etc. What’s important is that you know what it is you’re trying to get rid of. By specifically naming what weighs you down, you can connect with that energy and see the root cause of your negative vibrations. Once you identify the objects of the spiritual cleanse, it’s time to consider the context of each item. Individually, explore each component and ask yourself why it holds such an influence. It is through understanding your objects that you are better equipped to rid yourself of them. Visualize the negativity dissolving into dust. Use a spoken mantra. Verbalize that this negativity will no longer hold power over you. If you are religious, you can call on your chosen deity to help cleanse this item. Physically destroy a representation of the item through burning, shredding, dissolving, etc. You can use one — or a combination — of these methods. The important thing is to establish that this negatively will no longer hold power over you. Remember, cleansing yourself of negativity is more difficult than you might think. It may take multiple tries to fully cleanse your spirit. Don’t expect perfect results on the first try! Give yourself the space to fully approach each item with a open mindfulness. While the negative is being purged, the positive is given room to shine. Your aura needs to be strengthened after being weighed down by unhealthy vibrations. This can be accomplished through affirmations. State that you have been purified, and that your spiritual body is free. Affirm that you are a vessel of good energy and a conduit of wellness. This mantra helps further remove your psyche from all that would harm it. By enforcing your purity, you establish power over your own energy flow. It is within this power that you further open yourself to positive energy. This is one of the most common ways of practicing spiritual cleansing. It’s especially helpful for beginners. This could be because bathing is a literal visualization of the cleansing process. You are removing impurities in an object intended for cleaning. Thus, the mindset for purity is already established. There is actually a historic precedent of purity baths. There is a reason that nearly every religion includes water. For Christianity, there is the rebirth into Christ through baptism. In Judaism, there is the ‘Mikveh,’ which is a ritual bath. It’s used for establishing spiritual purity. To help enforce a holy experience, dilute your bath with salt. Use unrefined products, such as Himalayan crystals or sea flakes. 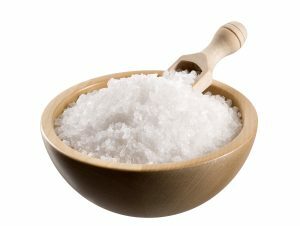 Don’t use common table salt, which is iodized and refined. Most of the natural minerals have been stripped away and cannot serve you. Add in two to three handfuls of your chosen salt and fill the tub to your liking. The volume of water is not important. Just make certain that the temperature is not too hot. If you go over 100° F, you can speed up your nervous system. This will heighten your vibrations and disturb the ritual. When using a bath to cleanse your aura, you shouldn’t be using any bathing products. This bath needs to be different from physical bathing. It is a holy ceremony that must be separated from a daily shower. Thus, this is not the time to use oil based soaps. Don’t use your lathered shampoos, or leave-in conditioner. Instead, take this time to connect with yourself. You must focus to enter into an elevated spiritual plane! 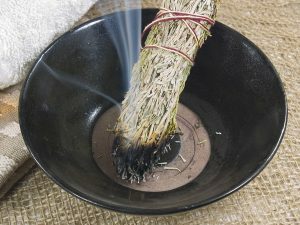 Smudging, also known as clearing, is a practice of burning bundles of herbs for purification. The released smoke changes the ionic composition in the air around you. This change alters your mindset, and creates a sense of calm. You clear any bad energy from a space and create a pure environment. Smudging is practiced in numerous religions. In history, the Christian burning of frankincense, the Buddhist burning of incense sticks, and the Native American burning of assorted plants are all examples. 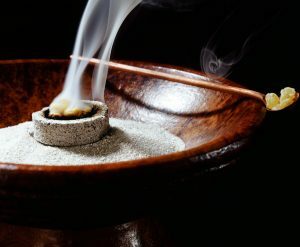 Smudging is used in hundreds of cultures. Many Native American tribes use smoke rituals. Some burn tobacco, sage, pinion, sweet grass, and even deerstongue. Herbs that are purifying for one tribe are taboo for others. You can smudge with your own choice herbs. This cleansing process is a healthy ritual that will positively stimulate your aura. Keep this in mind when establishing your smudging ceremony. Although many spiritualists choose sage as their sacred herb, you can branch out to others . Do your research and find what best fits your aura! Research can even better inform your cleansing process. Through discovering the past, you inform your present. By knowing the history, you honor everyone who practiced this ceremony. You open yourself further to positive prana. You prepare yourself for a more mindful experience. We live in a world that places a lot of demands on us. Spiritual cleansing is needed when life gets too overwhelming. You can cleanse as often as you wish. It will always bring you on a path towards mindfulness and healing. Remember that you cannot control your spiritual journey. It takes time and practice to reap the full benefits of a cleanse. But once you start this journey, you will gain insight with each session.